Primary Natural Resources oil, natural gas, fish, pearls. BAHRAIN IS LOCATED in the MIDDLE EAST; it is an archipelago in the PERSIAN GULF, east of SAUDI ARABIA. Bahrain has been the site of human habitation and commerce for millennia. Evidence of active trade between the great hearths of human civilization in Mesopotamia and the Indus Valley are to be found on the islands of Bahrain from as early as 5,000 years ago. Assyrian, Babylonian, Greek, and Persian kings laid claim to this trading center over the ages. First mentioned in Greek historical sources associated with Alexander the Great, Bahrain continued under its Greek name Tylos until the spread of Islam reached its inhabitants in the 7th century. Regional and foreign powers ranging from the Ummayad caliphs of SYRIA to the Christian monarchs of PORTUGAL continued to claim and dominate this pearling and trade center until the 18th century. In 1783, the Al Khalifa family seized Bahrain from a Persian garrison controlling the islands and established a ruling dynasty that continues to today. In the 1830s, the ruling Al Khalifa family entered into treaties with Britain as a protectorate and maintained that status until full independence was declared on August 15, 1971. Bahrain benefited as the first Gulf state to discover and exploit its oil potential beginning in the 1930s, but it never experienced vast oil wealth. Limitations on actual oil reserves within its national borders encouraged Bahrain to develop a more diversified economy that focused on petroleum refining rather than extraction. Following independence from Britain, the Al Khalifa monarchy experimented with election of a parliament but soon dissolved the National Assembly because of antagonism toward the monarchy and Western allies. The ruling family, the majority of government officials, and corporate leaders are Sunni Muslims. Bahrain’s Shia majority (70 percent) was politically disaffected and incidents of political violence were seen in the 1990s, resulting in killings and imprisonment. With the latest succession within the ruling family, a return to national elections has commenced, along with a general political amnesty. This first national election in over three decades saw a turnout of over 53 percent of eligible voters in the first round and 43 percent in the second round. The latest ruling Al Khalifa has changed his title from emir to king and continues to appoint the upper chamber of parliament as a balance to the lower generally elected chamber. 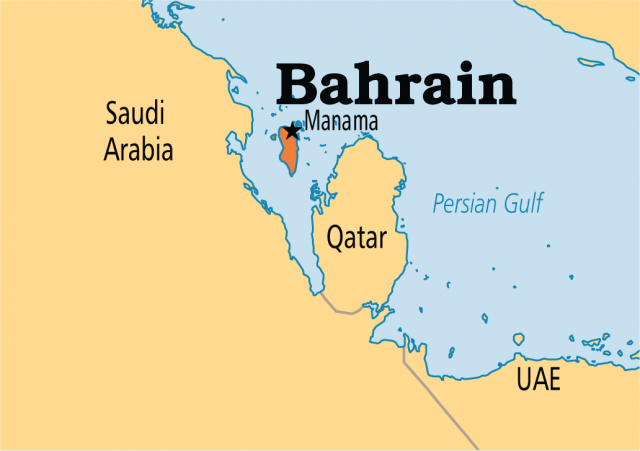 Bahrain has been the home of U.S. naval operations in the Persian Gulf since 1947 and has provided basing and overflight rights in support of military actions against Iraq since 1990. Bahrain supported the decade of sanctions conducted by coalition forces in support of United Nations mandates against Iraq. Bahrain’s economic diversification provided the Gulf region with an early window to Western financial, telecommunications, and industrial expertise. The region’s first oil refinery was built here in 1935 and heralded continual growth of joint ventures that expanded to ship building, metal manufacture, transportation infrastructure, and financial services. Bahrain boasts the presence of many international finance institutions and has created no impediments to their onshore or offshore operations. Bahrain further seeks to become the largest center of Islamic banking in the world. Working toward this goal, it has become a leader in the standardization of regulation for the Islamic banking industry. Bahrain was quick to invest oil revenues into national infrastructure, health services, and education. Bahrain enjoys the highest adult literacy rate in the region (89.1 percent). The modern communications and transportation network combined with Bahrain’s reputation as a relatively liberal and modern Persian Gulf state has added to its desirability as a tourist destination. With its special emphasis on education, Bahrain sees itself as a future provider of higher education in the region. Much financial support and investment has come from gulf neighbors. Saudi Arabia continues to subsidize much of required government revenue by granting oil as aid.